Lower Falls, Yellowstone. Look closely at upper left hand corner for green stripe. There are 290 waterfalls of at least 15 feet (4.6m) high in Yellowstone National Park. The highest one, Lower Falls, is also the most powerful. Feeding from the Yellowstone River, it boasts the largest volume of water of all waterfalls in the Rocky Mountains. Located in the state of Wyoming, near Yellowstone’s Canyon Village, Lower Falls can be accessed via a loop road as well as trails. 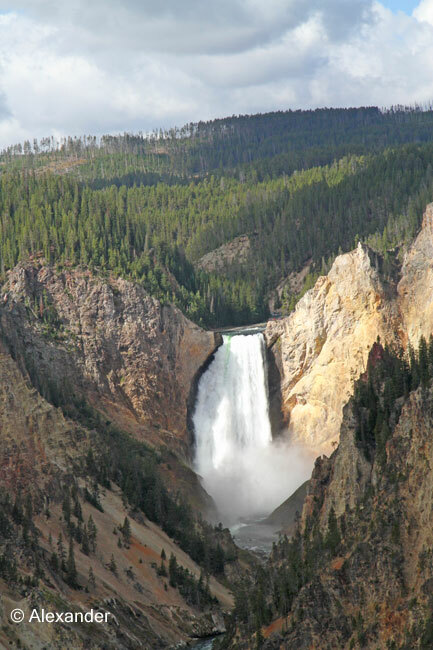 One of Yellowstone’s most popular sights, Lower Falls is 308 feet tall (twice the height of Niagara). Up river, out of sight from Lower Falls, is Upper Falls. Click here for info on Yellowstone Falls. Click here for National Park Service waterfall video and aerial photos. 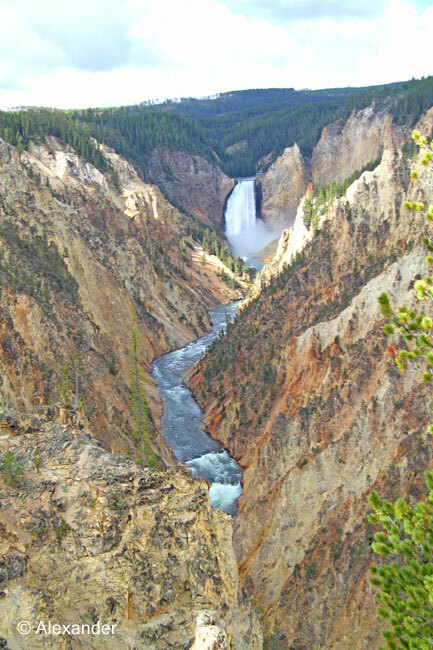 Surrounding the Lower Falls are majestic canyons, known as the Grand Canyon of Yellowstone. Carved by the Yellowstone River, it is 24 miles (39km) long and 1,200 feet (370m) deep. 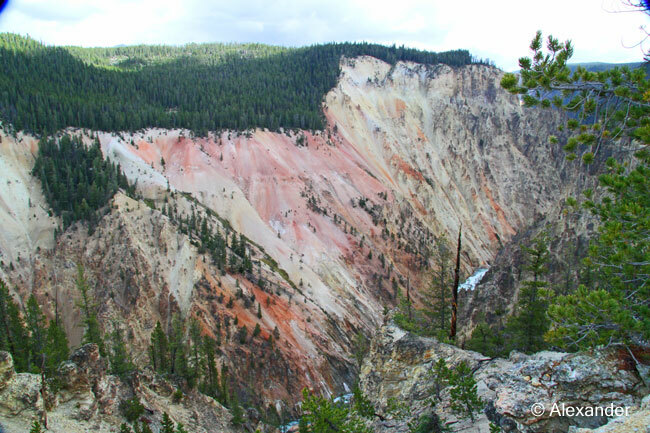 Natural features and activities such as rhyolite rock and other minerals, hydrothermal alteration, erosion, and oxidizing resulted in the unique coloration of the canyon. More about the Canyon here. The chromatic canyons, raging waterfalls, and rushing river present breathtaking vistas. I have memorable images of wonderful waterfalls all over this earth, but my favorite feature here at Lower Falls is the green stripe. Look closely (first photo) at the upper left hand side of the waterfall, you may be able to see the bright green stripe of water. It is mesmerizing to be there in person, watching. Emerald water plunging over the brink of the falls. There is a notch there that makes the water deeper, and keeps it from becoming frothy, thereby causing the water to appear darker as it rushes over the edge. In this spectacular place where humans have lived for 11,000 years, time shifts. Amid lakes, mountain ranges, waterfalls, wild animals, and thousands of geysers; it is impossible to see everything in two weeks, or even a lifetime. But being here, seeing what Native Americans, explorers, presidents, and millions of other viewers have revered over the centuries, you can breathe in the marvels and know utter fortune. I just saw them last month while on my trip to California. They look majestic! I am very glad you have seen the Lower Falls, Alok, and yes, they are so majestic. Thank you so much for your comment. you bring me to this morning. I am smiling with the thought of inspiring you to canoe today, David. So many, many people the Lower Falls have inspired, including you and me. Thanks so much, and have great fun portaging! How gorgeous, indeed, is our Earth. I am tickled to have reminded you of your visit, HJ, and as always, am very grateful for your comment and kind words. One of our best parks – a favorite of mine. It is mind-blowing, isn’t it Mary, to have so much majesty and beauty in one park. Thank you so much, and have yourself a wonderful week ahead. If you can believe it Jet we have not been to Yellowstone. The falls look astounding and will definitely be in our road trip future! I believe it, Sue. Because there is so much beauty all over the globe, and never enough time to see it all. You’ve done a good job, however, of seeing so much. And when you do get to Yellowstone, I know you and Dave will enjoy it. Thank you for your visit today! There’s a lot to love there, I’m glad you’ve adventured Yellowstone. Thank you Brian. Some day I’d love to go to Yellowstone! Beautiful photos. Yellowstone is a very remarkable and beautiful place. We camped there at least three times when the boys were little. We stood under one of the waterfalls once. Oh how wonderful to have visited multiple times, Carol Mae. And standing under a waterfall is such a thrill. Thanks for your great comment. It’s an amazing place. Thank you for your comment Ellada. Beautiful!! I have not been there since I was a kid….you took me back immediately…great post! Stunning pictures!! What a total pleasure it is, Kirt, to remind you of a happy time in a gorgeous place. Thanks so much for your wonderful comment and visit today. Grand beauty, it just doesn’t get any better. Thank you for sharing Yellowstone, Jet. “Grand beauty” is a great way to describe it, Sharon. It’s no wonder it is such a popular place. Thanks so much, as always, for your frequent visits and comments, my friend. Magnificent! And that green stripe is fascinating. Thx for pointing it out! I see so much more through your eyes, J.
I realized the green stripe was pretty small and might not be visible, but I decided to point it out anyway, and I’m glad I did. Really glad you saw it Nan! Thanks so much! I’m glad you enjoyed this trip to Yellowstone, Bill — thank you. And no matter how long you stand there staring at all the vastness around you, it’s still hard to grasp it, isn’t it, Amy? I have no doubt you will visit Yellowstone again. Thanks so much for your wonderful visit today. Definitely one of the best sites–and there are so many–in Yellowstone. Thanks for stopping by SWI, always a treat. Thanks so much, Frank, I’m happy you enjoyed the Lower Falls sites. Another lovely post of such an amazing place, closer to home for many of us than your other exotic travels. I last visited Yellowstone in ’79. It’s quite a place. There’s no place on earth quite like Yellowstone. I am happy to know you have visited Yellowstone, too, Gunta. Thanks so much for your visit. The only bummer thing about Yellowstone is the crowds. August will probably be booming with people, and then the wildlife is mostly just bison and an occasional moose or bear if you’re lucky; because they drift further away from the roads and the traffic. We went after Labor Day, to avoid the big crowds, but it was still extremely crowded. If you just take in the vistas and beauty, like Lower Falls, and don’t expect it to be teeming with wildlife, you’ll be just fine. Here are two posts I wrote on the geothermals that you might find interesting too. Thanks so much for the links and additional info, Jet! I know this year especially with the anniversary of the parks, it’ll be extremely crowded. Something my hubby won’t like, but I can withstand! Amazing! I hope I will visit this place in the future ❤ Thank you so much for sharing this, Jet! Now that you live in this country, Indah, you have so many beautiful new places to visit. I’m excited for you, and appreciate your visit. Voila! So glad you got to see the green strip, Lola. Thanks so much for your fun comment and visit. Beautiful. We’re spending the summer in Idaho and hope to make a couple of side trips to Yellowstone and the Tetons. So much to see! Oh you said it, Ingrid — so much to see! Have fun, my friend, and thanks for stopping by. BTW I’m going to the Crane Foundation in WI next month, thanks so much for your great posts on it. I want to visit this place of immense beauty, where time shifts! Wonderful post and photos! Another amazing place I hope to visit some day. Thank you for sharing, Jet.